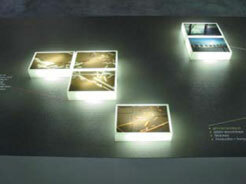 The area of display and presentation in PERSPEX is one of QD's primary fields of expertise. A high quality range of QD and customer designed PERSPEX display products are used world wide within Exhibitions, Art Gallery & Museum’s, Film and television set design, Art commissions and corporate Awards. Exhibitions displays with striking design and quality is critical to companies who wish to show their product at its best. QD have manufactured backdrops, plinths, specialist lighting diffusers, “on stand” features, product models and many more bespoke items for companies exhibiting worldwide. PERSPEX has proven to be the most dynamic material from which to create that all-important quality impact on exhibition and gallery visitors. In the world of gallery’s the protection and display of valuable works of art, history, and architectural importance together with interactive displays are also amongst QD’s prime areas of expertise. With the ability to both design and manufacture cases and stands to display artifact’s safely and to their full potential requires a great deal of understanding and skill, both of which QD possess. In the year 2000 QD were approached by a project management company by the name of Artis Europe Ltd with the idea of building a large (5 meter) diameter Perspex Dome. This dome was to be used as a back projection screen in the Goulandris Museum of natural history in Athens Greece. See the News section for the full story. 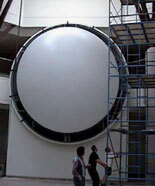 In 2006 QD were again commissioned to build another dome based on the successful design and build of the Athens dome. The 2006 dome was commissioned by Red Lion films of Pinewood Studios, England and was used in the film “Fred Clause”. The Pinewood Dome was 4.5 meters in diameter and finished to a high quality polished clear finish to allow through dome filming. Pictures of this project will be released at a future date. Read more in the News section. In more recent times the idea of corporate awards for company and individual success has seen a large growth in custom designed and manufactured awards for a wide range and size of companies. QD have manufactured awards based on commissioned and “in house” designs, examples of which can be seen in the images gallery. Artists have found PERSPEX to be a versatile medium in which to express their works. QD have worked with many award-winning artists such as Toby Paterson who has worked with QD on a wide range of commissions. Examples of private and commercial art commissions are shown in the images gallery.